Ambiente tranquillo lungo il Sud Black Creek, un proiettati in veranda con un tavolo da picnic e sedie per il vostro comfort, 1 camera da letto con letto matrimoniale, soggiorno aperto e cucina, un soppalco per i bambini e un bagno. Ottima vista del torrente guardando fuori dalla finestra del soggiorno. Cucina a gas in salotto per l'aspetto camino quando si diventa un po 'freddo fuori. Abbiamo installato un pozzo esterno per fuochi (portare il sedie da campo!) vicino al torrente e un comodo sentiero fino al torrente. Just the right size and very well kept------we love this place. The property is quiet, serene, and stunning in the wintertime. The cabin met all our needs for the weekend - our favorite parts being the large window overlooking the stream, the porch, and the overall coziness. We would definitely return! Exactly the relaxing getaway we were looking for! 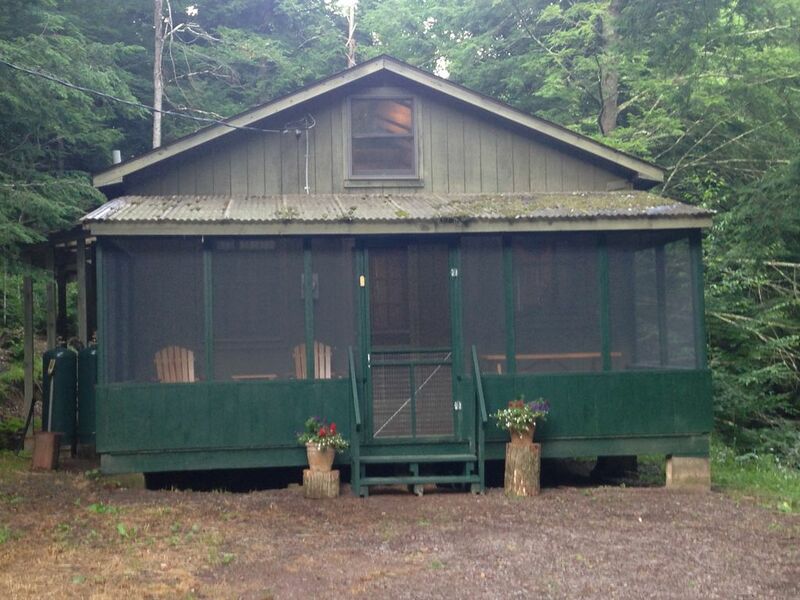 We had such a wonderful stay at Rick & Candy's cabin. It's cozy, yet roomy and we loved that there was a propane fireplace inside. The picture window next to the dining table overlooks the creek directly next to the cabin which provides awesome scenery while you sip your coffee in the morning as the sun comes up. We spent most of our time exploring the area, and we loved coming back to the cabin to build a fire in the large pit overlooking the creek. We loved how the property was secluded and private - you can't see any neighboring buildings. We also enjoyed not having cell service/Internet so we could all be truly unplugged and just enjoy each other's company. We look forward to our next stay at this cabin. Thanks for having us! This was the best weekend we have had in a long time! This cabin is so cozy and so relaxing by the creek! Our stay was so fantastic. We will definitely be visiting the cabin again in the near future! My fiancee and I had a wondeful stay at this cabin, for the 2nd time now! It was the perfect place to getaway for a few days, and get engaged!!! Everything worked, gas stove and fireplace both with no problems. It was nice and toasty in the cabin while 12 degrees outside. The road and driveway were both plowed before our arrival even though it snowed a few days before. Overall, great stay! Cabina si conveniantly trova nel bel mezzo del nulla! Tuttavia, potresti goderti una gita al Worlds End State Park o al Ricketts Glen State Park entrambi raggiungibili in auto in 20 minuti di auto. Eagles Mere ha aperto i musei dell'aeronautica e dell'auto da metà maggio a metà ottobre. Le attività locali includono il Founders Day a Dushore, la Sullivan County Fair, il Bowhunters Festival, il Fall Flaming Foilage Festival, il Wine Festival e il Pow-Wow che si tengono tutti al Forksville Fair Grounds. Generi alimentari e le esigenze di base possono essere acquistati in giro per la città di Dushore.